In eras gone by, teachers did much more than just impart information. They awakened in their pupils the motive to dig deeply into what was being taught. They passed on their reverence for the subject matter using an energy that is rapidly dissipating from humanity. It wasn’t the noisy zeal of ego driven emotion, it was something we now call presence, the embodiment of one’s knowledge. And the method for transmitting that knowledge is now known as the oral tradition. There is much more to the oral tradition than just explaining things verbally. The teacher transmits a certain vital energy along with the information. A common and familiar example of this way of transmitting energy is: two identical tuning forks; strike one and then hold it near the other without actually touching and the second one begins to vibrate. This phenomenon is called harmonic resonance. In a way, human beings are like very complex tuning forks. By sheer proximity, the living vibrations of one being can trigger corresponding vibrations in another. Similarly, the proximity of a teacher and pupil both transmits knowledge and the energy needed to understand it. The phenomenon of passing energy by harmonic resonance is crucial to the transmission of ancient musical knowledge, where the intended effect of the music was – is – to achieve transcendental states of mind. The teacher, steeped in the experience of transcendence, transmits to the pupil, along with technique, the very states of mind generated by the tradition being passed on. The music of ancient traditions by itself has some intrinsic power, but by itself it is not enough to induce the fullest transcendental experience. It is like an airplane speeding along the runway. It travels a certain distance, but it never takes off. For liftoff to take place, the musician must have learned from a master about transcendent states, and that only can occur by oral tradition. What is transcendence? It is the transformation of the ordinary mental state with its daily, mundane concerns, into an expansive, more cosmic mind in which the sense of infinity and eternity begin to replace the preoccupation with worldly circumstances. Transcendence occurs in degrees. The fullest degree is the complete immersion of awareness in the eternal and infinite Being. There are various methods for achieving this degree of transcendence, and all of them depend on the oral tradition to learn. One such method is found in a form we now call ancient eastern sacred music. The intent of the master is to inculcate in the pupil not just the technique of an instrument and the repertoire of traditional melodies, but the very state of mind that the music is there to bring; a transformation from the mundane to the miraculous. The power of the teacher to elevate the state of mind of the pupil is partly dependent on lineage, but it also depends on other factors. The hardships voluntarily undertaken for the sake of learning have a significant influence on how the learning goes. In order for the music to blossom into its most potent form, the musician must have undergone trials and tribulations, for the sake of their beloved music, both in the learning and the perfecting phases. Foremost in importance is the intent of the musician. Only a musician whose intent is transcendence can achieve it, and a talented, practiced professional musician, without that intent, can only play the outer form beautifully. Like the airplane forever taxiing back and forth on some runway, it will never ascend to the heights. Perhaps it is ironic to be writing – or reading – an article about the oral tradition, as if by written words alone this most difficult of principles could be passed on. We have all been exposed to some charismatic enthusiast for ideas about how we can be more, better, higher in consciousness than we currently are. And whether or not such an enthusiast is really qualified to transmit accurately the essence of a real teaching is almost beside the point. Anyone with a vivid sense of mission exudes a palpable force, an energy that almost by itself seems to make us swell with hope that we too could become as elevated as the charismatic person seems to be. Human beings can be very sensitive to an energy that some people seem to possess in greater degree than others, and who can transmit that energy at will, so it seems. And this is an important concept, because it forms the basis for the oral tradition in the transmission of ancient teachings, be the subject a musical tradition, dance or craft. In music, however, there is a real need for the oral method of teaching, especially among the ancient eastern musical traditions, in order for a master to successfully pass on knowledge of the art and craft of the tradition. Sacred music is based on the desire to achieve transcendental states of mind. The various forms of sacred music surviving today evolved in a culture that was steeped in and saturated with inward, contemplative, ecstatic states of mind. The origins of this kind of music are multiform. The three major centers are the Indian subcontinent, famous for transcendental meditation and other related contemplative traditions, Central Asia with its ancient shamanistic teachings and nature worship, and ancient Egypt, where the cult of immortality reached unprecedented heights. The idea that we exist in an invisible world that is concurrent with the visible, sensorially palpable world is pervasive throughout all cultures and civilizations. Of course, the universe is just what the word used to describe it means: one world, one ‘verse’ or one Being. Yet we carry this deep conviction that there is much more to existence than meets the eye, or any other of our physical senses. There is something utterly mysterious about the whole idea of Being that we find ourselves beholden to the wish to experience this invisible world, the noumenal world, directly. And the literature on this subject, described as metaphysical, mystical or occult, abounds. Much of that literature describes the noumenal world in terms of visual effects. However, physical eyes cannot apprehend the noumenal world any more than the nose or fingertips. But that doesn’t mean the noumenal is imperceptible to the human being who truly wishes to perceive it. We have a kind of sense organ that is apparently virtually unknown generally, which can be deployed to perceive the noumenal world; it is the human body as a whole. Like some great cosmic eardrum, the whole human body is a sensory organ that can perceive the noumenal world directly, and it is not a visual thing. The noumenal world is a vibration, and if there were any ordinary human sensory modality that could be rightly used to metaphorically represent that perception, it wouldn’t be vision, it would be hearing. The world is a world of vibrations, and the human hearing apparatus, beginning with the ear, is the closest thing in our familiar world to the unfamiliar phenomenon of our whole body as a perceiver of the noumenal world, the world as vibrating energy. In order for our consciousness to consciously participate in that perception, it needs to focus on the unique sensation of the entire physical body where all the real transactions of life take place. After a lifetime of focusing on mental images and the emotions they trigger, it is not so easy for a consciousness to sudden find the sensation of the whole body and perceive the real world of vibrating energies. A certain preparation is necessary, and that is where transcendental states of mind come in, and with them, all the artful methods that humanity has devised over the ages to reach that rarified state of mind. Ancient music from the Eastern world that gave us meditation and other mindful practices is one such artful modality, and it is wholly dependent on the oral tradition to learn the form as well as the content. For music to serve as a vehicle for transmitting the effects of transcendental states of mind, the form must correspond to the content, which is the intent of the musician to experience and transmit the energy that brings us the transcendent state. Every form of music corresponds to the intent of the composer, be it for entertainment, for military marching bands, for political and social commentary, for funeral processions, for romance, and for transcendence. Perhaps some forms will combine various fractions of various intents, but in general, the form must correspond. Focusing on music that is intended to transform the ordinary consciousness to a more cosmic consciousness, we can look at the form of certain ancient eastern traditional music that has been transmitted down the ages by the oral (aural) tradition, directly from master to pupil, by means of demonstrations, along with the harmonic resonance of passing on that special energy. There are several features that ancient eastern sacred music uses to that effect. The first and foremost is the employment of a property of music that cannot be accounted by ordinary scientific explanation: listening to musical scales induces in us human beings the effect of being transported. Even the simplest rendering of any seven toned scale, that is, a series of seven relatively harmonious tones between any two tones that constitute an octave (modal music), will unfailingly leave the listener with the distinct impression of having been taken from one ‘place’ to another, but not spatially, of course. Something inexplicable takes place in human beings when they attentively listen to a series of tones in a scale that begins on the tonic and proceeds to the octave above, or the octave below. There is a difference between the sensations that occurs from listening to an ascending scale than from a descending scale, and that is the second property of music that the ancient traditions rely on for their unique effects, the sense of transport up, and down. We are being taken up and down the scale of vibrations, and we instinctively feel the underlying reality, that existence is a scale of vibrations. Another inexplicable phenomenon occurs from delaying the last tone in that series. How is it possible that the playing of seven tones in a scale, then pausing before playing the last tone – the octave above the tonic – unfailingly induces in virtually every one of us the wish for completion? What is this world that music exists and has such a profound effect upon us human beings? Even the simplest rendition of a musical scale, with that hesitation before the sounding of the octave, has the power to make us want to hear that final tone, that closure to the sensation of having been transported. What is that sense? It cannot be explained, nor can it be described in words; it can only be demonstrated experientially. Furthermore, by artfully altering the specific tonalities in a given scale, radically different effects on states of human consciousness are obtained. In addition to the numerous minor scales – and the unique major scale – there is a world of possibilities for transcendence in the technique of playing melodies that incorporate microtones, deliberate deviations from the commonly heard harmonious intervals favored by ordinary musical forms. The phenomenon of the microtone is particularly interesting. Here is a tone that when played unintentionally merely sounds out of tune. Yet the very same tone, the same frequency of vibrations, when played intentionally, has the opposite effect. It takes on an aura of power. It feels like one has been instantly transported to an unknown world. It is the world of dissonance, and it greatly amplifies the listener’s yearning for closure. This intense yearning for something as mysterious as closure has the power to awaken the sensation of being in the noumenal world, the world of vibrating energies, the world of the infinite and eternal. It is possible to resist this effect. In fact, the effect is wholly dependent on a state I like to call active listening. It is a state of mind that all oral and aural traditions depend on. Without active listening, the effect may not be felt. Transcendent states of mind must be actively pursued. The immediate effect of special music that harks from an era when human beings coveted transcendental states of mind is to beckon, but it cannot forcibly drag anyone into a state of transcendence who isn’t ready and willing to be transformed by the intent that is at the core of this music. Another feature of the sacred music of the ancient eastern world that is crucial to its intended effect is the meter free melodies. This concept may be the most ‘alien’ of them all; it is certainly the most difficult to master. Meter free means the melody has no overt rhythm to guide the music, no repetitive beat to inform the musician when to play the next note. Learning to play music with a flexible tempo requires a special quality of listening. And just as with microtones, which must be played with great deliberateness, the moment of playing the tones in meter free music must be similarly intended. There is no other way to learn the special syntax of meter free music than the oral tradition, where the intent of the music must be delivered along with the technique. And the syntax cannot be arbitrary. It has to match the intent of the music, which, as we explained above, is to be transported, so to speak. The peculiar syntax of ancient eastern meter free music seems to resemble the syntax of epic storytelling, as if we are being guided on our trip inward, to the ‘place’ where transcendence is possible. 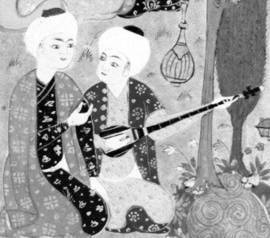 Another important feature of ancient eastern music is the convoluted melodic line, resembling the twists and turns, the under / over complexity of arabesque. This impression is further strengthened by the sense that the melody is not a fixed composition but is being rendered in a fresh and new way in the present moment. There is the original composition which took centuries to evolve, and there is the demand for a fresh expression of that traditional composition. The word ‘improvisation’ comes to mind, a word most commonly associated with jazz, and ancient eastern sacred music is not jazz, certainly, but it may be the only way we can describe this feature of the traditional music of the ancient east. Not only would written score undermine the improvisational aspect of this music, it also circumvents the student’s struggle to ‘find’ the melody inside so that the expression of it through the instrument or voice requires the element of intention. Ancient eastern sacred music embodies a legacy of knowledge which can put us in touch with a current of energy that originated during an epoch when the transmission of wisdom was passed on exclusively in the oral tradition, with no coded symbols to intervene and insulate the listeners from the intent of the masters: transcendence. It is a path to perceiving the noumenal world, the real world of vibrating energies. And that is the true legacy of the ancient eastern traditions of sacred music. Jeffrey Werbock joined the Gurdjieff Foundation in Los Angeles in 1971. The following year, Mr. Werbock met an unusual elderly musician living in Los Angeles. Originally from Daghestan, a country in the north Caucasus, Zevulon Avshalomov knew how to play the art music from Azerbaijan known as mugham. His instrument was the kamancha, a four-stringed spike fiddle with a spheroidal resonator. On first hearing, Mr. Werbock was deeply impressed by the sound of the instrument, the power of mugham, and by the energy and presence of the old man from Daghestan.Inspired by the power of mugham and the knowledge that it originated in Gurdjieff’s homeland, the Caucasus, Mr. Werbock experienced a strong desire to try to learn this ancient music. After nearly one year of apprenticeship, Mr. Avshalomov decided to move to Brooklyn. Soon after, Mr. Werbock followed his teacher east, where they lived together for three years, engaging in the tradition of student and teacher, disciple and master, while immersed in the old world atmosphere generated by Avshalomov. In 1977 Mr. Werbock moved to Manhattan and continued to study with his first teacher for another ten years. In 1987, after a protracted illness, Mr. Avshalomov died. The following year, a troupe of professional Azerbaijani musicians came to America. Still grieving over the loss of his teacher and father figure, Mr. Werbock went to their concert in New York, and after the performance approached one of the musicians and asked how to get an invitation to Azerbaijan for the purpose of meeting musicians and furthering his knowledge of the art of mugham. Since his first visit to Azerbaijan in 1989, Mr. Werbock has had many adventures, music lessons, concerts and public appearances there. During this time he has been bringing this beautiful and ancient music to members of Gurdjieff groups and other audiences in the United States and Europe. Samples of his playing mugham on kamancha, and his thoughts about this music can be found at the website: www.mugham.net. Previous Post Are You A Psychic Vampire? Check Your Energy! Next Post Thank You India, Thank You 0~>9, Thank You Disillusionment, Thank you.